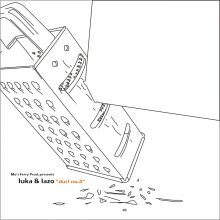 Luka & Lazo’s third act on Mo’s Ferry Prod. Once again the two croatians give us fresh and grooving proof that it is not necessary for them to go along with typical minimal sounds. No question that this EP with it’s bodyrocking tracks is ruled over with a funk that so many technoproducers would like to call their own, while they still end up with the everpresent unisound, because it just seems easier to go along with the present minimal standards. Luka & Lazo don’t have to do that and in each of their tracks you can sense the joy of not being „one of them“. It’s a celebration of difference and of the knowledge how to do that alternative Rockshit. Barem of Foundsound adds his version of techno with a remix of „dust no.4“ that pushes it more to the border of essential minirave.